I've held off as long as I can updating everyone on our plans for the summer not because I am reluctant to share them but simply because I had no idea. We have been working many ideas and angles. It wasn't clear which plan would bear fruit. However, now the various pieces are coming together. We know where we're going to be for the next five months. First, the economic fiasco up in the States has made it impossible for us to return to our old lives. In order to live in the States full time, DrC and I would need to work full time and we can't. DrC can't go back to work full time in the Seattle area because the practice that bought his practice doesn't need him full time, and he's not allowed to work for anyone else up there for another two years. Unemployment in my industry – computer and software development – is at an all time high with 800 resumes showing up for each listing posted. In order to live in Mexico cruising, however, we only need to work roughly three months out of the year which is actually relatively easy to arrange. DrC can work part-time for his old practice, and people who have laid off all their technical writers find themselves suddenly in need of a contract technical writer for a few weeks every few months. I know that seems odd. What I'm saying is that it's cheaper and more responsible for us to be irresponsible, semi-retired nomads than it is for us to try to work for full time. But once you start thinking like this, all sorts of fun ideas pop into your head. For example, why cruise? Why work only in the United States? Why tie yourself to just American clients? We've been putting out feelers in every direction to see what would happen. While a recent tentative assignment to the Caribbean fell through, we are eager to see what happens and ready to move in any direction except backwards including those that might take us to New Zealand, the South Pacific, South American, or the wilds of western Canada. So our plans are all tentative; our planning horizon is month-to-month. As long as the cruising kitty has about six months to a year cushion, we'll just keep stringing these opportunities together like pearls on a rope and see where they lead us. 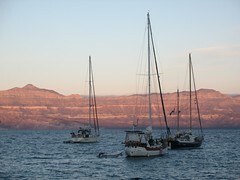 May and June -- Cruise slowly in a big half circle up and and over through the Sea of Cortez from La Paz to Guyamas. July -- DrC working in Seattle while the girls and Toast try to survive the heat in Guaymas. August -- Family wedding in New Mexico for the first week and then three or four weeks of car camping with Grandma Sue in the Southwest United States. September -- DrC working in Seattle while the girls and Toast swing south visiting a few land based and boat friends before heading back down to Mexico. October -- Meet up in Guaymas and prep the boat for another cruising season. So... you and the girls not heading farther north this summer? I came over to your blog to ask you a question about this very thing - and then I find you've basically answered it! Anyway, I'm writing an article for Examiner.com about the idea of families taking extended trips during these tough financial times and would like to get some input from other famililes. In these difficult economic times, most people are tightening their belts and doing what they can to save money and reduce costs. Vacations is one of the first things that get cut out of the budget. How is it that you are able to travel during this crisis? How are you financing your journey? 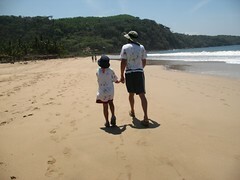 What tips do you have for another family considering an extended trip? Hey, if you stop in the Bay Area, let me know. The kids would love to visit you and hang out on your boat, and we'd love to have you over for a meal.